In dry flux application, the flux powder is electrostatically charged (typical voltage is ~ 100 kV) and applied to a grounded work piece. An electrical field results in flux deposition of the work piece. In practice, anisotropic distribution of the electric field can influence the homogeneity of powder coverage. At edges powder may accumulate, while penetration of powder into deep/thick fin packages (e.g., in case of double row tubes) can be limited by the Faraday cage effect. Flux powder is electrically charged in the gun. However, it loses charge relatively fast when it hits the grounded heat exchanger. Therefore adhesion of the flux on the work piece is established rather by relatively weak Van der Waals forces than by electrostatic forces. Fine flux particles adhere better on the surface – but they are more difficult to operate with in the dry powder feeding system. The relatively fine flux particles are more difficult to handle in dry powder feed systems compared to coarser paint powders – therefore the equipment used for electrostatic flux application is adapted to meet the specific requirements. Venturi pump, hose diameter, air flow and spray nozzle suitable for flux application are designed to minimize the possibility for powder buildup and clogging in the system. Powder transport within the hose system and the spray nozzle is further enhanced by introduction of additional air streams. The direction of the powder flow should always be from top to bottom. Sharp changes in flow direction must be avoided. In critical areas additional vibration units are installed to avoid powder buildup. The first type starts with the flux powder being fluidized in a fluidization vessel by compressed air that is fed through a porous membrane at the bottom of the fluidization vessel. The air going through the flux makes it behave like a fluid, since the powder is essentially diluted with air. A pick up tube attached to a Venturi pump is extended into the fluidized flux. Powder dosage is controlled by the volume of air flow through the pump. To optimize fluidization the vessel may additionally be equipped with a stirrer. This type of feed system works perfectly well for classic electrostatic paints powders that are easy to fluidize, however, it may be difficult to establish a stable fluidization with ‘standard’ flux powder (i.e. the flux powder quality offered for wet/slurry-based flux application). Fluctuations in density of the fluidized bed can result in inhomogeneous spray pattern (splashing) and might be a source for flux buildup within the system. NOCOLOK® Flux Drystatic is optimized to minimize the challenges of powder feeding, while providing sufficient fine particle fraction for good adhesion properties. The second type of powder feed system works on the principle of feeding the powder by a rotating helix screw (see the illustrations in the article above). 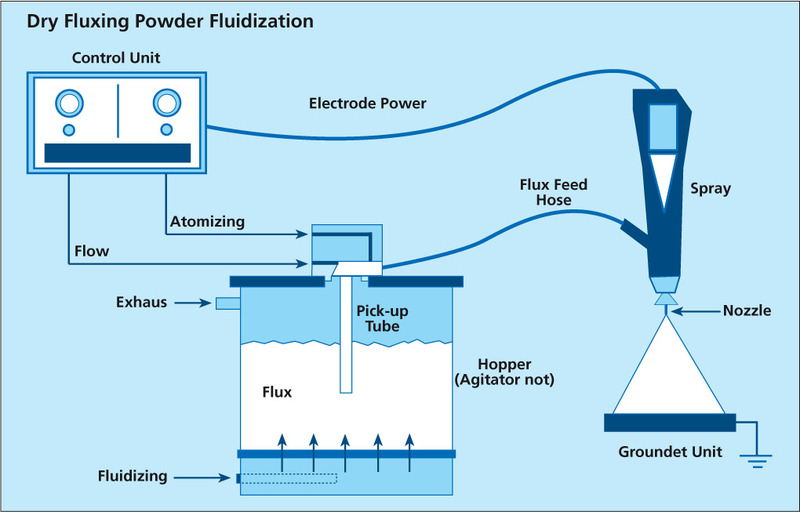 Because of the mechanical displacement of the flux powder from the hopper, such devices minimize fluctuations of flux powder flow. Most mechanical type of dry flux feed systems work with standard quality NOCOLOK® Flux as well as with special ‘Drystatic’ grade NOCOLOK® powder. To achieve flux distribution patterns for specific process needs (e.g., higher flux loads in tube to header areas, coating from both sides of thick cores), multiple spray nozzles are arranged for deposition of the necessary flux load at different locations of the heat exchanger. 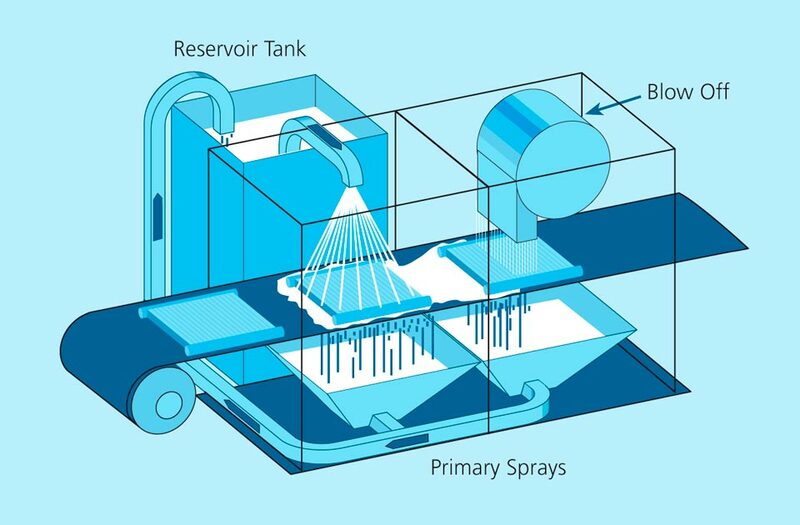 Dry fluxing booths must be equipped with a filter system to collect the overspray. The overspray material is recycled within the booth. To avoid accumulation of impurities within the recovered flux, it is necessary to take care of the booth environment (i.e. avoid dust, fumes, and high humidity level) as well as for the quality of the compressed air used. Contamination introduced by the heat exchangers or the transport belt must be prevented as well. Due to the relatively weak flux adhesion (compared with wet- or paint- application methods), handling of dry fluxed parts should be done with special care to avoid flux fall off, especially at higher flux loads. To reduce flux fall off, some users perform electrostatic fluxing on heat exchangers with evaporative oils still present on the surfaces. Thermal degreasing in this case takes place after fluxing – just before the parts enter the brazing furnace. The article was written on the basis of frequently asked questions from companies which either wanted to start a new all-aluminium brazing production of heat exchangers or wanted to convert from copper and aluminium mechanical assembly design to all-aluminium brazed parts. The questions were grouped into three main categories: Equipment (emphasis on assembling process), Process (emphasis on different fluxes and fluxing methods) and Corrosion. Specific production challenges are also presented, which are important not only to newcomers of all-aluminium brazed heat exchangers, but to established companies as well. These include typical brazing problems such as managing leaks and the basics of brazing copper to aluminium. These topics are discussed by their relevance to the brazing parameters and their role in successful brazing. Increasing environmental concern has identified the air conditioning and refrigeration industry as one of the contributors to the greenhouse effect and ozone depletion. Accordingly to  15% of all electricity consumption in the developed world is used by the air conditioning and refrigerator industry. Increasing the efficiency of these heat transfer systems has the positive impact of decreasing electricity consumption and therefore the overall emission of CO2. The advantages of all aluminium brazed condensers in an air conditioning system are well described in . For example one such case study  allowed for saving about 2700 USD during 6 months. The above advantages are currently well recognized by both the air conditioning manufacturers and their end users. It is our observation that the majority of the companies in the HVAC industry which have started or are about to start production of aluminium brazed heat exchangers have only limited experience with aluminium brazing; therefore providing them with maximum possible technical assistance from the supplier side is of high importance. This article was written on the basis of our contacts with such companies having an aim to offer some assistance to all newcomers and companies facing some troubles with their new type of production. It is a complex issue which mainly depends on size of the products, its diversity and overall planned production volume. 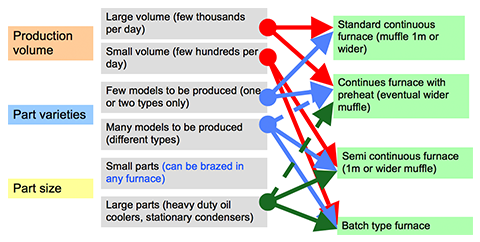 The general principles for the choice of the brazing furnace are shown in Fig. 1. It should be pointed out that the furnace manufacturers will make a brazing furnace customized to particular requirements of a given client. The straight forward answer is: No! Aluminium requires high precision for assembling (recommended gap size is 0.1 to 0.15mm), which is hardly ever achieved for brazing copper parts. Also one should remember that any copper contamination on aluminium can cause catastrophic brazing failures (holes). The process of component assembly can be done on a simple manual stacker or on machines with varying degrees of automation through to fully automated units. The level of automation should be mainly determined by the planned production volume, but also other factors such as local labour costs should also be considered. After laying out the tubes and fins, the tubes must be pushed precisely into position determined by the slots in the headers. the vertical alignment of the tubes must be secured either by steel plate or by hammering the tubes with a special pad. Threading the headers on the tubes should be done in one single action which does not allow for any side or vertical deflection of the headers. After threading the headers the fixtures should be assembled and the tube pusher released. Basically there are rigid and elastic designs which allow for some expansion when the core is heated. For larger cores elastic design is preferred. This type of fixture is reusable, also known as a permanent fixture and can go through the brazing cycle several hundred times. Apart from that we could use single usage fixtures, known as disposable fixtures and these include steel wire and steel bands. The multi-use fixtures must be made of stainless steel and in most cases the single use fixtures are usually made of ordinary low carbon steel. When designing the length of the fixture (distance marked in red as Ls in fig. 2, one must remember thatthere is a difference in thermal expansion coefficient between aluminium and steel. To compensate for this, the following assumption is made: The length of the steel fixture at brazing temperature must be equal to the nominal width of the aluminium exchanger at brazing temperature. On this basis, an equation can be used describing the linear change of dimensions with temperature. Lo – Nominal width of the part. As an example, for a part having width of 900 mm and nominal tube spacing of 8 mm, solving this equation and taking into account the fact that after assembly there must be some pressure exerted by the fixture on the part, the length of the fixture should be 907.5 mm and the fin height 8.08 mm. The longer steel fixture is compensated by the increased fin height. It also means that after assembly the part will have a slightly barrel-like shape (bowed out at the sides). The question: ”What final checks are required for brazed parts?”is also connected to equipment purchases. All brazed parts must be checked for leak tightness. The most simple method is the so called “under water test”. In this case the part is pressurized with air and lowered into a water bath to look for bubbles. However some end users require more accurate and reliable methods. In the automotive industry it is common to check condensers for leaks with high pressure and extremely sensitive helium leak detection devices. Each product should be accepted by the end user. In every case the scope of acceptance tests should be agreed to between the manufacturer and the end users. Typical tests include burst pressure, thermal cycling and of course standard ones for heat transfer efficiency and pressure drop. As a general rule it can be said that all aluminium parts should meet all the requirements applied to copper/brass parts. This technique, also known as dry fluxing is gaining popularity as an alternative fluxing practice and therefore will be described here in some detail. Dry fluxing is a technology whereby the flux is electrostatically charged and applied to a grounded work piece, in our case a heat exchanger or individual heat exchanger components. The electrostatic attraction causes a layer of flux to be deposited on the work piece. A typical flux application system consists of a powder feed system, the electrostatic spray gun, the gun control unit, the grounded work piece and finally the flux recovery system. The advantages of such a system over conventional wet fluxing are evident. Since the flux is applied dry, there is no need to prepare flux slurries, hence no need to monitor flux slurry concentrations. There is also no wastewater generated therefore more environmentally friendly. The dehydration or dry-off section of the furnace may be eliminated since the heat exchangers enter the furnace already dry. However, one must keep in mind that this is a relatively new fluxing technique and there are some minor drawbacks. Flux adhesion is not as good compared to that of wet fluxing. The flux also tends to accumulate on the leading edges of the heat exchanger and because of the Faraday cage effect, may have some difficulties in coating into corners or more specifically, in tube to header joints. Presently, there are two types of powder feed systems on the market. 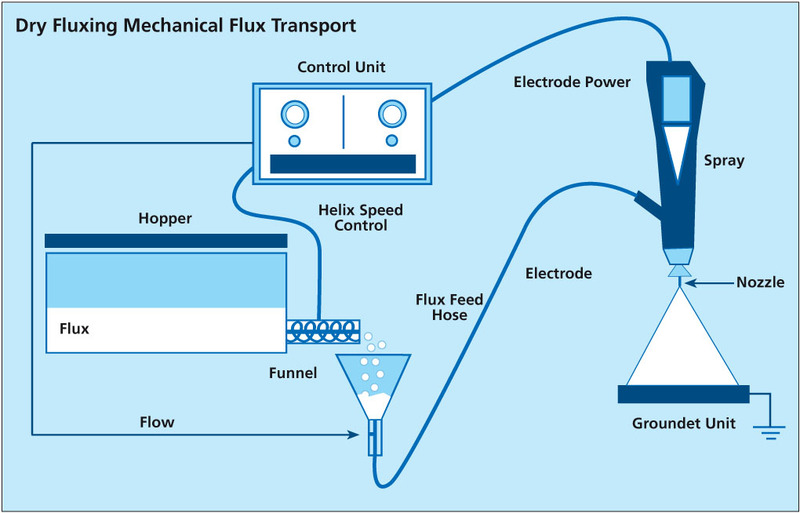 The first type begins with the flux being fluidized in a hopper. Dry compressed air is fed through a porous membrane in the bottom of the hopper. The air rising through the volume of flux makes it behave like a fluid since the powder is essentially diluted with air. A pick up tube attached to an air pump is extended in the fluidized flux. Powder flow is then regulated by controlling the air-flow to the pump which is then delivered through the feed system to the spray gun. This type of feed system works perfectly well for powder paints. However, the flux has very different physical characteristics than powder paints (particle size, morphology) and so is difficult to fluidize. This must be taken into consideration when the manufacturer designs a powder feed system that relies on fluidization. The second type of powder feed system works on the principle of mechanical delivery or positive displacement. This means that the powder feed rate to the air pump is controlled by a screw or auger. The flux is contained in a main feed hopper and delivered mechanically at a controlled feed rate to the air pump. Powder flow is thus regulated by controlling the auger feed rate. This powder feed system does not rely on the flux being fluidized. Nonetheless, modifications over conventional mechanical powder feed systems are still necessary to overcome the differences between the flux characteristics and conventional powder paints. Japanese heat exchanger manufacturers have used the technique of dry fluxing for many years now. Within the last few years, North American and European manufacturers have also installed electrostatic fluxing stations. Experience with this technique is being accumulated at a rapid rate, given that the equipment manufacturers and flux suppliers are taking an active role in improving the technology.